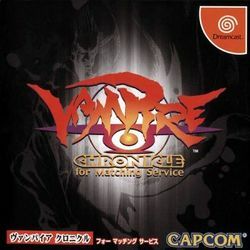 Vampire Chronicle for Matching Service was first released exclusively for the Sega Dreamcast in Japan by Capcom in 2000. Much like Hyper Street Fighter II, it allows players to pit one version of Darkstalker's characters against an entirely different version. For example, Night Warriors Morrigan can fight against Vampire Savior Sasquatch. This version of Vampire even allowed players to select styles of characters for games that they weren't originally present in, like a Darkstalkers version of Hsien-Ko, or a Night Warriors version of Jedah. Before each player chooses a character and style, a version must first be chosen that governs the rules, health meter, and Special meter of a particular match. Selecting a different version for your character only affects which moves they have available. It was later redeveloped for the PSP as Vampire Chronicle: The Chaos Tower, and released outside of Japan as Darkstalkers Chronicle: The Chaos Tower. It included a new game play mode called "The Tower" that was like a combination of King of Fighters XI's Challenge mode and Street Fighter Alpha 3's World Tour mode. This page was last edited on 13 April 2016, at 18:09.